December 16, 2016, 11:31 AM · Violinist Joshua Brown, 17, is the newest recipient of an instrument loan through the Chicago-based Stradivari Society. 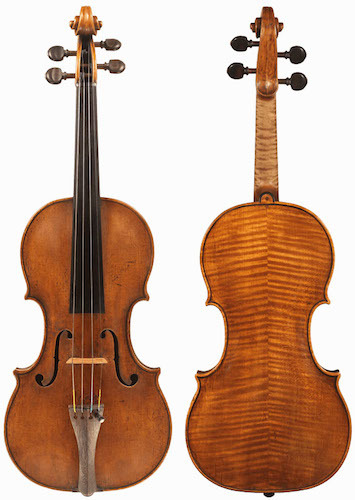 Brown, a student of Almita and Roland Vamos at the Academy of the Music Institute of Chicago, will have long-term use of a 1679 Pietro Guarneri made in Cremona, loaned through a generous patron. Already a veteran of the competition circuit, Brown has won top prizes at many competitions, including the 2015 IX International Tchaikovsky Competition (Audience Award, Honorable Mention, the Academy of Arts Golden Medal, and the Siberian Academy of Arts Talent Award); the 2015 Cooper International Violin Competition (Second Place and the Audience Award); and the 2016 Stradivarius International Violin Competition (Third Place). Brown has made solo appearances on NPR’s From the Top and on WFMT’s Introductions; and he has performed with many orchestras, including the Cleveland Orchestra and the Ars Viva Symphony Orchestra. A National YoungArts winner in 2016 and 2017, he also won the 2015 Music Institute of Chicago Concerto Competition. “I am so grateful and honored that the Stradivari Society has granted me the long-term use of the Pietro Guarneri violin," Brown said. "Playing such a high caliber instrument really opens up so many more ways for me to express myself as a musician, and I am so thankful to both my patron and the Society for believing in me." The Stradivari Society has been pairing artist with instruments since 1985, when it all began with the loan of the 1735 "David" Guarneri del Gesù to Midori. Encouraged by the late Dorothy DeLay (Midori's teacher - and many others'! ), the late Geoffrey Fushi (of Chicago's Bein and Fushi) and Mary Galvin founded the Society to help pair fine instruments and patrons with promising young artists. 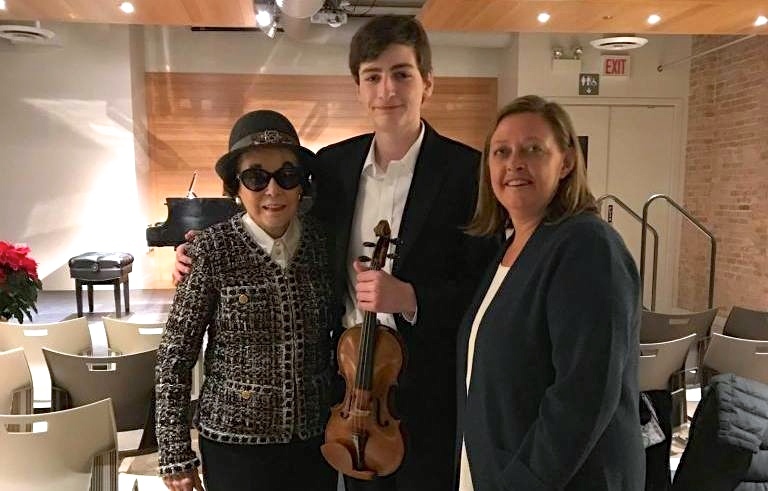 Stradivari Society Founder Mary Galvin with Joshua Brown and Society Executive Director Suzanne Fushi. Photo by Melanie Brown. Since its inception, the Stradivari Society has enabled instrument loans for numerous artists including Joshua Bell, Gil Shaham, Vadim Repin, Midori, Sarah Chang, Vadim Gluzman, Philippe Quint, Augustin Hadelich, Maxim Vengerov, Paul Huang, and Kyoko Takezawa. The organization also assisted teachers, foundations, and ensembles with loans of great Italian antique instruments. December 19, 2016 at 05:26 AM · Any and all prodigies deserve the best advantages to advance the skill of art. To me, Hillary Hahn is the superlative artist today. And anyone who can match her standard of excellence and carry it forward will receive my undying respect. December 20, 2016 at 05:25 PM · I'm so proud of my cousin Joshua, as well as his siblings. They have always had an amazing talent with a violin, and it was always a pleasure hearing them play the instrument with such elegance. I know that Joshua has a bright & successful future ahead of him.